After arriving just in the nick of time to rescue the Thundercats from Slithe's Lizard army, Panthro shows himself to be every bit the withdrawn loner. He devotes his full attention to his beloved Thundertank, showing little to no regard for Lion-O’s kingly status. He then embarks on a mission to retrieve Thundrillium from an underground deposit that is being mined by the lizards. 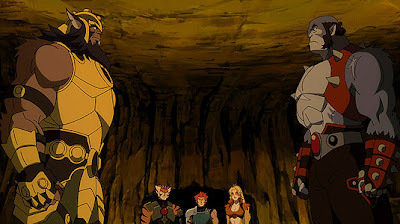 To his chagrin, Lion-O, Tigra, and Cheetara accompany him on his quest. As they make their way to the mines, Panthro silently reminisces over his adventures with the treacherous Grune. “Old Friends” focuses mainly on the return of Panthro, and provides vital details of Grunes betrayal. It abandons the formula established by the previous two episodes in which the title characters encounter and aid the various mythical creatures of Third Earth. The departure is a welcome one, as it gets back to the political intrigue and Arthurian overtones introduced in the series premiere. “Old Friends” also introduces some elements borrowed from other popular modern myths. The action quotient has been upped considerably from the last two episodes, as Panthro’s flashbacks allow for a more eventful narrative. Viewers are shown Panthro’s memories of the battles he fought alongside Grune. The action scenes in the flashbacks are of slightly more barbaric variety, which is fitting as they depict scenes of war. There’s even a scene of Panthro and Grune hunting, killing and eating an animal. Now that’s something I’m sure Rankin Bass wouldn’t have had the stones to show. “Old Friends” reintroduces another character from the original series known as the Driller. His redesign owes a bit to The Transformers, which is another welcome change from the original. He is something of an accessory to this episode, and isn’t particularly essential save for a well-staged battle between him and Lion-O towards the end. Speaking of The Transformers, it should be noted that Thundrillium basically serves a similar purpose as energon. It’s interesting how so many 80’s cartoons feature some vital mineral or fuel. As with the syndicated series from the 80’s, this new version of Thundercats borrows from the popular myths of the day. The theme of betrayal and feels lifted from Star Wars (as well as Shakespeare’s Othello), as does some of the imagery. Panthro is shown falling down a bottomless shaft in Mumm-Ra’s pyramid. The visual is reminiscent of similar ones from The Empire Strikes Back, Return of the Jedi, and The Phantom Menace. The milieu of Third Earth is very obviously inspired by that of J.R.R Tolkien’s Middle Earth. The lizard soldiers are nothing more than cannon fodder to be cut down by the heroes, just like Orcs or Storm Troopers. “Old Friends” is the best episode of this series since the two part premiere. It does away with the cutesy elements introduced by the last two episodes and focuses on the action. The mere presence of Panthro brings an entirely different mood to the series. It would be nice if that mood could be maintained for the next three episodes, but maybe that’s a little selfish. This series is primarily aimed at kids, at no so much at the adults who grew up with the original. Well, it’s actually aimed at both, but it needn’t be a po-faced action series in order to appease the man children of the world.